Last week the Eco Committee members at Thomas’s School were invited by the Parish Council, in co-operation with the Borough Council, to plant a tree as a final act in the local Jubilee celebrations. The tree, an English Oak, was planted in open space land in the village so that it can be enjoyed by future generations and there will be a plaque put next to it to commemorate the Queens Diamond Jubilee. The children (including Thomas) put the top soil around the tree and sprinkled wildflower seeds around the base. Thomas has been on the Eco Committee this year and has thoroughly enjoyed being involved in the Eco work at school as well as providing his own input with regards to the wildlife that is in the school grounds. The School has put up bird boxes one of which has a camera, a bird table for feeding the birds, a nesting material holder, fat ball feeders and other bird feeders as well as insect houses. The school gardening year has come to an end and preparations have been made for the summer holidays. All the young plants in pots have been planted in the ground, climbing plants have been tied in and supports provided, and the raised beds have been weeded and covered with netting to deter unwanted visitors. During the holidays Thomas and I will make regular checks to keep the garden ticking over until September this ties in well with feeding the school chickens as Thomas has been put on the ‘chicken rota’ again which I have to say I enjoy doing as much as he does. We are both looking forward to those super fresh boiled eggs! Click here for our top 10 tips for caring for the school garden during the holidays. Meet our delightful family of Wurzels Napus and Cascara Wurzel and their two children Compo Wurzel and Tumshie Wurzel. They will entertain your family and share their great sense of fun with you for years. All these fun scarecrows come dressed in their own pair of brand new jeans, T shirt and cravat and can be positioned right away. Their arms are articulated and bend allowing you to change their posture and their clothes, They will sit down or stand at home, in a garden or field. Scarecrows are a fabulously imaginative present for Christmas, Halloween, Guy Fawkes Night or Birthdays and Anniversaries They are unique. Dress your Scarecrow as a Member of your team, your school or a favoured character. The possibilities are endless. Every scarecrow will differ slightly owing to the nature of being hand-made, and using different facial features and clothes. Distinguishing features will be individual and therefore differ slightly with each member of the Wurzel family but there will remain a family likeness. Re-use any packaging to stuff the clothes. This wonderful family of handmade articulated Scarecrows will quickly become part of your own family. They assume a sort of life of their own and watch out, they can suddenly put their arms round you, quite unexpectedly! Napus and Cascara extended stand about 2m high, including the removable standing post which needs to go 40cm in the ground. Teenagers, Neep and Tumshie Wurzel are 1.75cm tall inclusive of post as above. For all the details of how to buy your very own to keep click here. Ice lollies can be expensive to buy and don’t always taste great – so why not make your own. They only cost a few pence to make and will taste MUCH nicer!! Huge thanks to everyone who took part in our October competitions. The word search proved to be a hugely popular indoor activity for lots of gardening clubs and many of the pumpkin recipes were just delicious! …The first correct word search entry out of the hat was from the gardening club at More Park R.C Primary School in Kent. Congratulations to you all your bird feeding prizes are on their way to you. We do hope you enjoy feeding the birds at your school over the winter months. 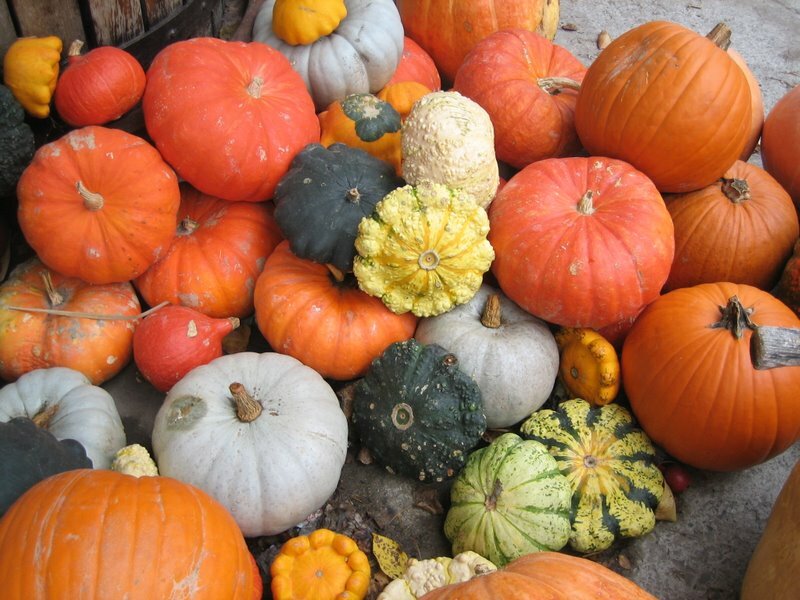 Our favourite pumpkin recipe came from Ileana Fernandes in Slough. Congratulations Ileana for a truly yummy entry. Below is her recipe for pumpkin, ricotta and pesto lasagne. We have found that one of the secrets to a good recipe is some fresh herbs to complement the other ingredients. For everything you need to grow your own herbs on a windowsill take a look here. Serve with fresh green salad drizzled with pesto – DELICIOUS! If you would like the chance to win a bird bath, a wooden bird table and some bird feed mix why not enter our family competition for November 2010. …And if you are from a school have a go at our school competition where you could win a Recycling DVD, a leaf mould composter and a bottle of compost magic! The closing date for both competitions is 30th November 2010 so get your entries to us as soon as you can! It’s a time saving, convenient way of gardening whilst working in harmony with the environment. ….And it produces great results every time, in just a few simple steps. 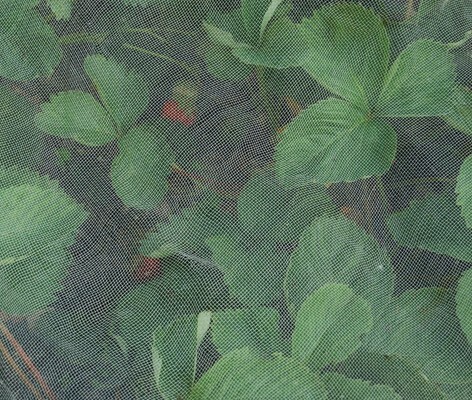 The biodegradable box is planted in the ground, or in a tub or window box. The box contains carefully selected plants (either bulbs or seeds) that have been carefully arranged and spaced in the boxes inner compartments by horticulturist, Jayne Lawton. In this way the plants are given the optimum space for growth. We currently have three Garden Groboxes to choose from. The Grobox Garden contains a selection of flower bulbs. The bulb varieties vary depending on the season in which you buy your grobox, but each variety offers beautiful flowering results year on year. The Grobox Organic Vegetable Garden in a box contains a variety of vegetables, which varies depending on the season but typically includes onions, peas, beans, lettuces, rocket, cabbages, courgettes and carrots. 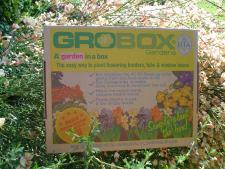 The GroBox is made from recycled cardboard and acts as an insulator for the plants, protecting them from prolonged cold, ground frosts and pests. The cardboard also contains a conditioner so when it degrades it releases nutrients increasing the fertility of the soil around the plants. This means that it can be planted almost anywhere in the garden regardless of soil quality, drainage or fertility. Soil quality in Britain is in decline even though there is a government strategy in place to try and protect it. Being organic the GroBox is an environmentally friendly EcoBox which improves the fertility of life-soil whilst giving great crops of flowers and vegetables. The harvesting season is now in full swing and the winning and loosing crops of the year begin to make themselves know. In the feast and famine world that is our allotment, now is definitely a time of feasting with gluts of runner beans, courgettes and soft fruits. We returned this week after two weeks away, and found that we barely recognised our beautifully tended plot, which seemed to have run rampant and wild almost overnight. To make the best of your harvest here are some helpful tips. Always harvest crops when they are at their best. 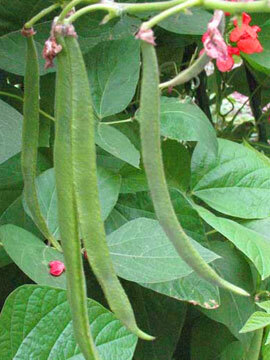 Don’t be tempted to just pick what you want for your immediate needs and then leave the rest, as crops will quickly go over, with lettuces bolting, runner beans going stringy and broad beans turning into bullets. And that’s to say nothing of the pests that will be eyeing things up ready to pounce. If you have a surplus try setting up a bit of an exchange scheme with fellow gardeners. That way you get to taste crops that you haven’t grown, in exchange for things you have too much of – a real win win! For crops that store well such as onions and garlic clean off, and dry out in a cool dark space. If kept correctly these can last very well for many months. Take a look at these great wooden storage boxes, perfectly designed for storing fruit, vegetables and bulbs. If you are getting a bit bored of the same vegetables get adventurous and check our blog regularly for recipe ideas. There are lots of recipes available for soups, chutneys and jams and we will be featuring our favourites over the coming weeks. As each crop comes to an end don’t forget to recycle all of your plant waste in a compost bin. That way you will have some lovely soil conditioner all ready for the next gardening year. Don’t forget to involve the children in the harvesting activities. My children love it and although they seem to want to eat most of it, guzzling raw beans and peas like no tomorrow, I do get a sense of satisfaction at getting them to eat their greens so easily at this time of year. The children’s trug and wheelbarrow are designed with children in mind and are perfect for harvesting activities.